Josephine Baker and Château des Milandes, her "Sleeping Beauty Castle"
Who was the American superstar who adopted 10 boys and 2 girls of different races and religions because she believed that people of all nationalities could live together in peace? If I'm ever asked this question while playing Trivial Pursuit, I'll be quick to respond, "Josephine Baker". It's one of the many intriguing facts that I learned about the American Music Hall performer while visiting the museum dedicated to her life and career at the castle she purchased in 1947. Perched on a craggy hill overlooking the Dordogne River, it's easy to understand why Josephine fell in love with Château des Milandes, calling it her "Sleeping Beauty Castle". The Gothic facade, stained glass windows, gargoyles and terraced gardens must have seemed like a fairy tale come true for the performer who was born in the slums of St. Louis, Missouri in 1906. Thanks to Josephine's star billing at the Folies Bergère and the subsequent opening of her own cabaret in Pigalle, the "Venus of Ebony" quickly became one of the highest paid entertainers in Europe and the favorite of artists and intellectuals such as Picasso, Maurice Chevalier, e. e. cummings, Jean Cocteau and Ernest Hemingway, who thought she was "the most beautiful woman there is, there ever was, or ever will be." 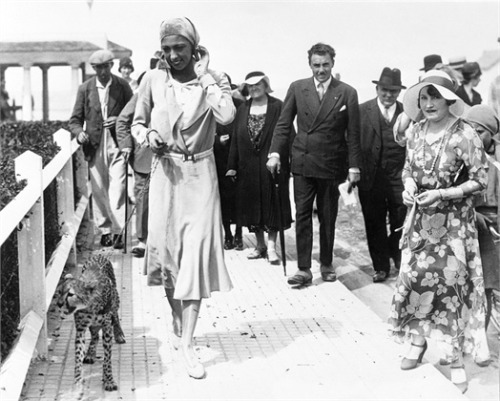 Wealthy beyond her wildest dreams, Josephine had a penchant for dressing in designer clothes and parading her pet leopard down the elegant Champs Elysées. Her life took a more serious turn when Germany occupied Belgium at the beginning of the Second World War and Josephine became a Red Cross nurse in charge of a refugee camp at the Gare du Nord. She also played an active role in the French Resistance by carrying secret information written with invisible ink on sheet music after telling the Head of the Counter-Intelligence Services "It is France that has made me who I am. I will be forever grateful to this country ... I am ready to give my life for France ... use me however you deem fit." In return for risking her life for five years, Josephine was awarded the Rosette of the Résistance in 1946 and the Legion of Honor and the Croix de Guerre in 1961. Château des Milandes, Josephine Baker's "Sleeping Beauty Castle"
Josephine Baker rented Château des Milandes and used it as a hiding place for both Jewish refugees and weapons for the Resistance during the Second World War. In 1947, she purchased the castle and transformed the estate into an amusement park with a dance hall called "Le Sans Souci" ("The Place of no Worries"), a theater, a J-shaped swimming pool, a tennis court and a mini-golf. Between 1954 and 1960, half a million people per year visited Josephine's castle to enjoy the ballets, jazz evenings, fireworks and dances. Beginning in the 1950s, Baker and Jo Bouillon, her fourth husband, adopted children from Korea, Japan, Finland, Columbia, France, Ivory Coast, Venezuela and Morocco and brought them to Chateau de Milandes where they attended the village school and were taught French by a private instructor. 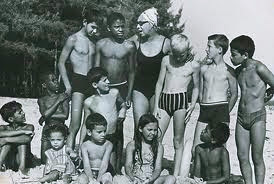 It was Josephine's hope that her "Rainbow Tribe" would be a symbol of a united and happy multi-racial family. Alas, Baker's extravagant lifestyle proved to be her downfall. Unable to limit Josephine's excessive spending, Jo Bouillon left to open a restaurant in Argentina in 1961. After being put up for auction several times, Milandes was sold for one-tenth of its value in 1968, with a clause giving Josephine the right to live there for another year. When Josephine was notified while on tour that the new owner was planning to evict her, she returned home and barricaded herself inside. In a reprehensible act, workers locked Josephine out of the castle when she went outside to collect some water. Photos show Josephine huddled on her doorstep in a state of shock before she was taken to the hospital. Upon her release, she was allowed to remain in Milandes for the remainder of the year. At the age of 62, Josephine moved to the Cote d'Azur. Josephine's remarkable life ended on April 12, 1975 when she suffered a brain hemorrhage while in Paris to perform at the Bobino Theater in a spectacle celebrating her 50 years in show business. Please click here to visit the official website for the Château des Milandes. Wow, what an amazing woman! I went to google to look up photos of her and her leopard, only to realise that you had one on the blog yesterday. I think it says something for a woman if she can completely outshine a leopard! I also realised I have a (faux) vintage nightclub poster featuring her somewhere at my parents' place - I just liked the picture, but it's great to know a bit about her. She really did outshine the leopard! I didn't even notice it in the photo that I selected for yesterday's post because I was so captivated by her face. Did you find any pics of her walking the leopard? I'm going to have to put my google skills to the test and see what I can come up with. If you're ever in the Dordogne Valley, I highly recommend visting Milandes. Our visit was tinged with a bit of sadness because of what happened towards the end of her life. I wanted a fairytale ending. I love the deciduous ivy on the turret of the castle. I wonder where all her children are today and what they're doing. The ivy and turret side of the castle provided the backdrop for a really good "birds of prey" show. The falcons kept swooping down right next to Stephane's and my heads. It was very impressive to see their hunting skills in action. The show also featured some hawks, eagles and owls. Regarding Josephine's children, here's what the brochure says, "In 1875, the eldest of the Bouillon children was 23 years old; after Moise's death, there were 11 children left in the "Rainbow Tribe". Some of the children decided to join their father in Argentina, while others chose to stay in Paris with Jo Bouillon's niece. Now adults, they occasionally come to visit the Milandes, a place full of fond memories of their mother". Some of the children have written books that were on display in the gift shop. ?? 1875 the eldest was 23 ??????? Oops, sorry for the typo! It should have been 1975. Fascinating woman and great documentary footage. I haven't had the chance to watch all of the documentary yet because I watched segments of several different ones before deciding to post the BBC one but it seems to be very well done. She was definitely a fascinating woman. 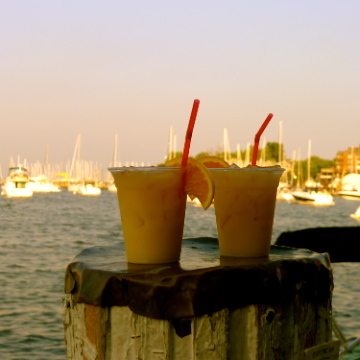 Very interesting post, Mary Kay, of someone I knew very little about. Thanks, Aussie. 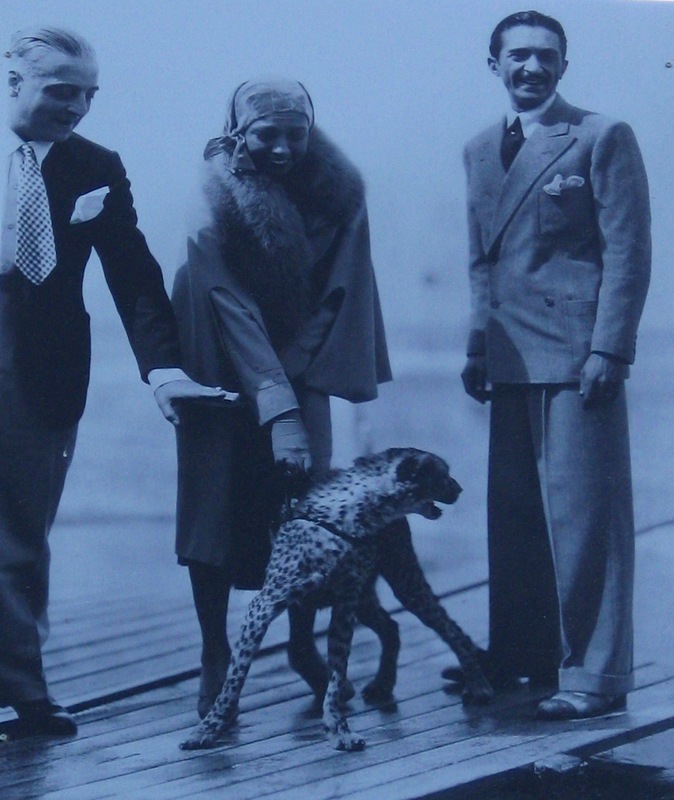 Until we visited Milandes, I thought that Josephine Baker was just another American expat in Paris (albeit a famous one) and had no idea about the rest of her life. Just goes to show what we can learn when we travel outside of the city! I've been a fan of her music for years (great during a winter's night party), but knew very little of her story. Fascinating! "They rebelled when they reached puberty. Baker had acquired 10 sons, with only seven years separating the youngest and the oldest, and they turned into a horde of hyperactive teenagers -- going out at night, falling in love, staying away for days at a time, rattling around the neighborhood on their mopeds, getting drunk, taking drugs, stealing and wearing hippy clothes that their mother didn't like. But her slaps no longer intimidated them. They were as wild and unruly as a pack of young wolves, and Baker had little experience as a mother." It's a shame that things were rocky between Josephine and her children although I can only imagine how difficult it would have been to suddenly become the mother of 12. I think that her idealism, while admirable, far outweighed her ability to care for such a large brood. Stephane and I both felt that there was a certain tangible sadness while visting Milandes and compared Josephine with Michael Jackson because they both created fantasy worlds. Thanks for posting the information about Josephine's relationship with her children! WIth winter on its way, I'm going to follow your example and make a Josephine Baker playlist. I have seen that documentary before, so did know some of her story. I am always impressed by acts of heroism, but it made me think how I would react in a similar war situation? Would I have the courage to risk my life by carrying secret messages or sheltering Jewish people?. I suppose you don't know till you are in that situation, but somehow I think I would be too cowardly. A truly remarkable and unique woman. Denise, I would beg to differ with you because I think you would be one of the people whose compassion for others would give you the courage and strength to do whatever needed to be done. Let's hope that we're never put in the situation where we find out. Your recent post about your father's experiences during WWII have me feeling very fortunate that we aren't living in a country at war. There was a pretty good TV movie "The Josephine Baker Story" in the 1990's, with Lynn Whitfield in the title role. Won a slew of Emmys & a Golden Globe or two. Sadly, she wasn't treated much better in the US when she returned a Star, even barred from using the front door of her hotel. Apparently, Walter Winchell took a dislike to her and skewered her every chance he got and with his power at the time, made staying here almost impossible. Still revered by so many even today, she had an amazingly complicated life. Thanks for mentioning "The Josephine Baker Story". I hope that it's available on itunes so that I can watch it. One of the things that I didn't realize about JB until I saw the BBC documentary is that she gave up her US citizenship. There were many years that she couldn't travel to the USA because the government revoked her visitor's visa. I agree - she had an amazingly complicated life. Incredible. Just incredible. Thank you MK for this excellent post. "Who was the American superstar who adopted 10 boys and 2 girls of different races and religions because she believed that people of all nationalities could live together in peace?" Okay, so am I the only one who would have said Angelina Jolie had a photo not been provided? Or is this one of those facts that EVERYBODY just knows? ....except me. I'd love to see a photo of her in haute couture with her pet leopard casually walking down the Champs-Elysees. Talk about working it. So fierce. I would have also thought of Angelina Jolie but after hearing about the number of children that Josephine Baker adopted, I googled the number for AJ and was surprised that she has only adopted 3 children. For some reason, it seems like she had adopted a lot more. I think that Mia Farrow has adopted 11 children so maybe Josephine Baker holds the adoption record. So fierce is right. What a woman! We have met two of Josephines sons and they were both competely charming so they somehow must have overcome their adolescent wildness as most of us do! What a wonderful tribute to Josephine! She's widely known and loved here in Paris. There's even a large swimming pool floating on the Seine that's named after her. Thanks for leaving your email address. I'll definitely contact you because I would like to hear more about your exciting project!